India has a warm and moist climate – ideal conditions for thunderstorms and hail. 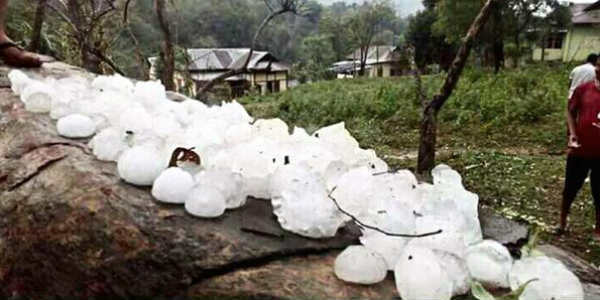 India’s hailstorms frequently cause property damage and injuries to people and livestock. The most damaging storm hit India on April 30, 1988, resulting in deaths to approximately 250 people and 1,500 livestock. A hailstorm of that intensity has not happened in India since, but hail remains a common occurrence there. For example, in March 2014, ten thousand villagers of the Madhya Pradesh were adversely affected by a severe hailstorm and suffered heavy loss to the Rabi crop (wheat, cereals, millets, pulses and oilseeds). The 2014 storm was noteworthy because two-thirds of India’s population is dependent on agriculture for their livelihood. After the March 2014 hail storm, Agriculture Insurance Company of India (AICI), a carrier part of the National Agricultural Insurance Scheme (NAIS), denied liability. Insurance issued through AICI is compulsory for all farmers who access seasonal crop production credit from the lending institutions and is voluntary for non-loanee farmers. NAIS has three overall objectives: (1) provide a measure of financial support to farmers in the event of crop failure as a result of an insured peril; (2) to restore the credit eligibility of farmers after a crop failure for the next season; and (3) to support and stimulate the production of cereals, pulses and oilseeds. AICI insures against yield loss due to non-preventable risks, including damage caused by hailstorms. AICI developed a complex weather index program which has subsequently attracted government premium subsidies. Government financial support for the NAIS is split between the federal government and the state and union territory governments. Since AICI is heavily subsidized by the government, banks market and administer the NAIS scheme on behalf of AICI. The banks’ charges comprise 5% of AICI’s premium while operating costs amount to another 2% of premium. Because the AICI operates at a low overall cost structure, the company maintains low premiums for farmers. Litigation resulting from AICI’s denial of claims resulting from the March 2014 hail storm was later considered by the Madhya Pradesh High Court. The bench of justices SK Gangele and Sheel Nagu ordered the company to process all the farmers’ claims under the scheme and compensate for the losses. This marked the first time that insurance claims for crop loss due to hailstorm were ordered to be paid by AICI. Despite the ultimate outcome of the 2014 hailstorm litigation, it seems that Indian farmers are still skeptical of crop insurance programs. Only 42.82 million hectares (or 22 percent) of crops were covered by crop insurance in 2014. Furthermore, the average sum insured (maximum amount that insurance would pay in the event of crop damage) is far below the gross value of output for most crops. The combination of these two factors likely deters many farmers from investing in crop protection. However, in 2016, the Narendra Modi government implemented a new crop insurance scheme with lower premiums. Because India’s agriculture industry remains critical to its economy, and weather conditions are favorable to hailstorms, crop insurance for hail damage should play an important role in the future of India’s insurance market, and other jurisdictions experiencing similar damage to crops from hail may look to India for guidance in addressing such claims.